Bright Light has a raised steering position with winch operated full sliding canopy that can be opened on warmer days offering excellent visibility. Saloon seating converts to provide an additional double bed. Forward double cabin with en-suite. Fixed quarter berth – ideal for a child. 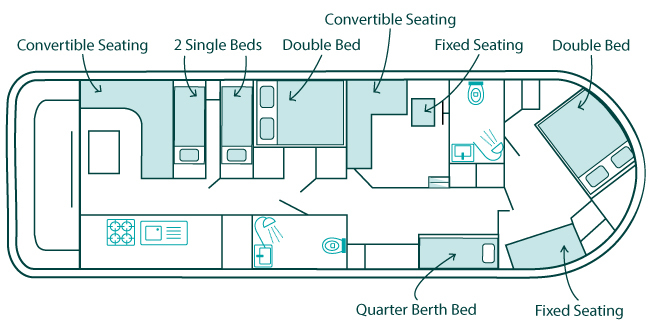 Mid double cabin with separate bathroom opposite. Further twin cabin. Large rear dining area with seating that converts to an additional double bed and door to rear sun deck, perfect for fishing or sunbathing. Bridge Clearance: 7 ft. Will pass under Ludham, Wayford and Wroxham bridges subject to weather and tide conditions with the canopy and windscreen lowered. Will only pass under Beccles Old and Potter Heigham bridges at extreme low tide (Bridge pilot service must be used when passing under Wroxham & Potter Heigham bridges).